One question we’re often asked is: why are you still talking about email marketing? With the rise of social media it has become an endangered species, hasn’t it? This is an excellent question, indeed. Of course, social media have to be part of your online marketing strategy. With 1.5 billion people registered on Facebook and 284 million active users on Twitter, you have to be active on those platforms if you want to reach your customers. 1. Emails are still at the heart of the online experience. Today 85 percent of the people online communicate through email. That’s about 2.9 billion people who send and receive emails on a regular basis. In the U.S., 91 percent of all consumers check their inbox every day! With the rise of smart phones and mobile devices, people can access the Internet all the time, and most of them use it to check their emails. So by the end of 2017 there will be up to 4.9 billion email users. 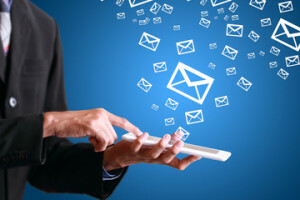 It is no surprise marketers are voting for email marketing again. 2. Email marketing is great at acquiring customers. There is so much noise on social media platforms nowadays that it has become difficult for companies to stand out. Today, organic reach on Facebook has dropped to just 6 percent, and the life span of your posts on your fans’ wall is four hours on average. When it comes to acquiring new customers, email is about 40 times more effective than Facebook and Twitter. That’s why many online retailers keep using email marketing as their main customer acquisition tactic. 3. Email is an effective tool to engage with your subscribers and turn them into loyal customers. Sending emails is a great way to connect with your customers by creating value for them. You can talk to them, tailor your content, and send them personalized product recommendations. Since they voluntarily opted-in, they are not only willing to listen to what you have to tell them, they also enjoy receiving your emails. For them, it is a way of being in touch with your company as well as receiving offers, coupons and rewards. Often, they’re even ready to spend more money! 4. Email marketing has never been so easy and affordable. Services like MailChimp or AWeber allow you to setup email marketing campaigns very easily. For instance, with MailChimp, you can create your own HTML templates and send out emails up to 2,000 contacts for free. And if you have more than 2,000 contacts, it costs no more than a few cents per email. It makes email marketing much cheaper than TV, radio or direct mail. All you have to do is create the content, and you can do it yourself. With an ROI of 4,300 percent, emails remain by far the hallmark of all marketing tactics!